One of the truly great things about Washington D.C. is that you can find just about any type of food from around the world here. I love any type of non-American food (and it's usually more gluten-free friendly), but until recently have not sought out Thai food in the District. Thai food is my favorite of the Asian cuisines because it is just so flavorful and comforting. 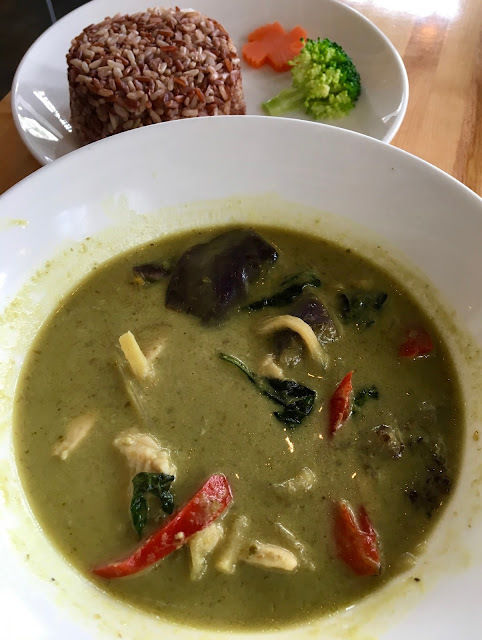 I love curries and the abundance of safe ingredients used, so I decided to seek out Beau Thai after looking for a gluten-free friendly Thai place in the city. 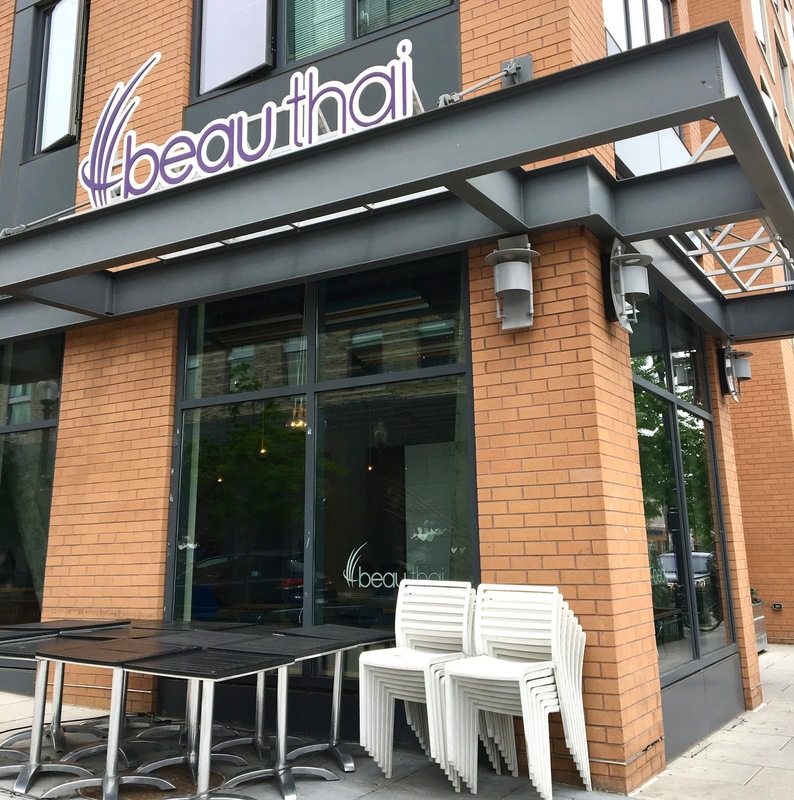 Located in the Shaw neighborhood of the city, Beau Thai takes pride in serving fresh, authentic fare that has won "Best Thai Restaurant" in Washington City Paper's annual poll for several years in a row. I stopped by during their weekend brunch, and was excited to get my first taste of Thai food in a while. With a beautiful dining room and large windows perfect for people (and dog) watching, I knew it was a perfect choice to spend a Sunday dining out. Beau Thai marks their menu to indicate gluten-free and vegan options. Quite a few options were both gluten-free and vegan. I let the wait staff know I was an allergy order, and they assured me they would let the kitchen know. 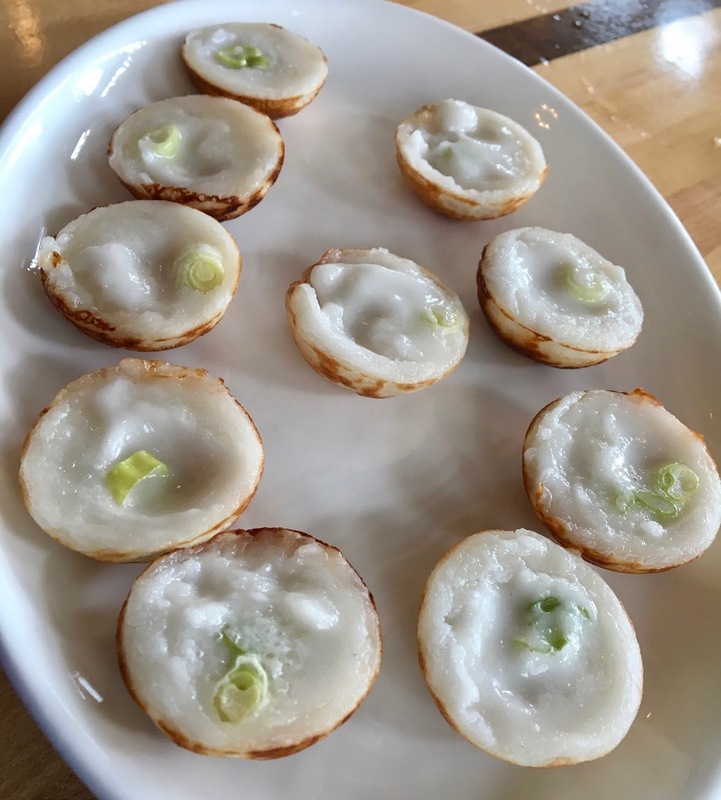 For an appetizer, I ordered kanom krok off of the brunch menu, which was a dish that was totally new to me. I figured since I ordered green curry as my entree (I always order green curry), I should try something new too. The dish was both gluten-free and vegan. Kanom krok consists of delicate rice flour "bowls" that are filled with a coconut milk custard that is slightly sweet. A green onion adds a burst of flavor and color to the delicate "bowls." I will admit that I was a little timid to give these a try, but I broke into a huge grin after the first bite. The texture is so unique, creamy, crunchy, and deliciously rich. I do not like the taste of coconut, but here it was less overpowering, and offset by the onion and sweetness of the creme. The shells were adorable and had the most unique flavor and texture. While the dish was new to me, I loved it, but regretfully could not enjoy every bite because I knew eating every one of them would fill me up too much to enjoy my entree. I ordered green curry for my entree, with a side of brown rice (which comes with a $2 upcharge). The portioning was also generous as it was with the kanom krok. I loved the rich, creamy, velvety curry, which had the signature lemongrass-lime-basil-chili flavor. It was not super hot, but definitely had a bite to it. I selected chicken as my protein, and the curry also came with Thai eggplant, bamboo shoots, red pepper, and Thai basil. Each was cooked to perfection, and were in perfect flavor balance with the complex curry. The brown (almost purple) rice was nutty and also generously portioned. A tad dry, I enjoyed it most by stirring in spoonfuls with the curry. Beau Thai definitely impressed me with their delicious flavors and friendly staff. I liked that I had many options to choose from, and that the dining area had tons of ample sunlight to brighten the space. While the food is a tad pricy (my meal was $21), the food had good quality and was clearly prepared with care. Beau Thai will be a place I will visit to treat myself, and I look forward to bringing a friend or two next time to try a greater variety of dishes. If I return on a weekend, I will most definitely order the kanom krok again!